Army Officers LEAD the world’s greatest military. Army Officers are Army Strong! -Col. Glenn Goldman, Commander 2nd Brigade (Army ROTC). At this time, the Fort Drum Green to Gold team is still the only full-time outfit dedicated to advising, coaching, and mentoring enlisted Soldiers who wish to pursue an ROTC Green to Gold application. Our team is well-positioned to reach out and coordinate with our USACC and USAREC partners to create a new wave of synergy in the Green to Gold sphere. Our team has been very successful at Fort Drum. 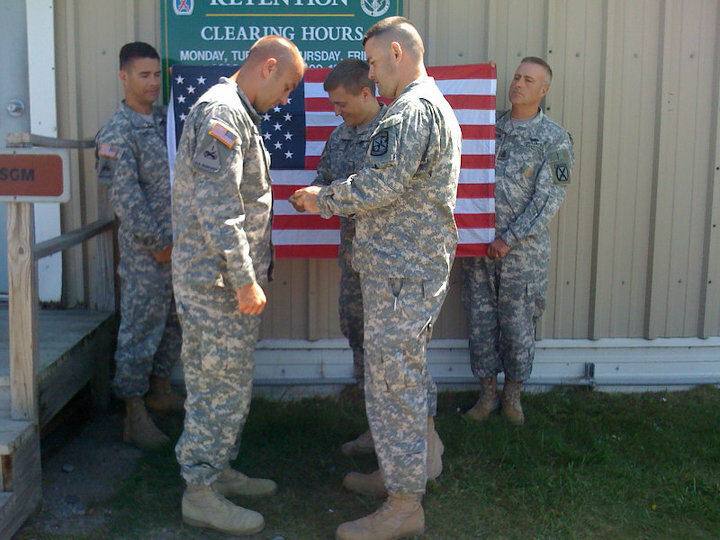 In the first year of our mission, we successfully quadrupled the historical average of enlisted Soldiers going Green to Gold on our post. In the April board, we beat the historical average eight-fold! We attribute our success to our social media outreach, and our commitment to forming relationships in our community – at universities, at ROTC battalions, at USMA and nearby recruiting battalions, and at local organizations on our post at Fort Drum. We’ve got a lot to offer, but SO DO YOU! Are you a ROO at a counterpart battalion? Are you the go-to expert at your organization for recruiting/outreach? What have you learned that the G2G community can benefit from? We also want to help. We want to drive traffic to YOUR website, to YOUR school, and put you in touch with enlisted Soldiers that want to talk to YOU! We will soon be contacting members of the community in order to brainstorm how we can create more synergy in the G2G mission. 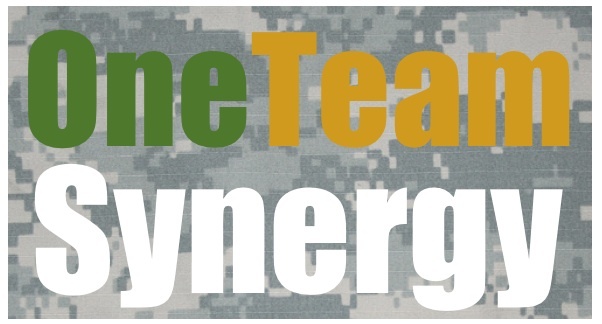 We will be putting out updates in our new infoblog category “One Team Synergy” so check back frequently. You can contact us too if you are as hot as we are to generate synergy. Let’s continue climbing higher together. To the Top! The last Green to Gold April board was a huge success! This Fall, a record 19 Fort Drum enlisted Soldiers will begin the next step in their careers as Green to Gold Cadets. This year, 6 Fort Drum Soldiers received the Commanding General’s Hip-Pocket Scholarship, and 4 applicants were picked up for the highly competitve Active Duty Option. 9 Soldiers were approved by their Commanders to separate early under the Non-Scholarship Green to Gold option. Over $710,000 in scholarship benefits was awarded to Fort Drum Soldiers in the April Green to Gold Board. Mrs. Shelly Gillespie (right) pins her daughter, SGT Courtney Gillespie, with cadet rank after being sworn in on Friday, 2 September 2010. Cadet Courtney Gillespie was one of five Soldiers selected by CG, Maj. Gen. James Terry for the CG's Hip-Pocket Scholarship. She will attend the University of Cincinnati to study sociology. SGT Patrick Fall (left) finalizes his Division Hip Pocket Scholarship with the signing of his U.S Army ROTC contract to attend St. John's Fisher as part of R.I.T Army ROTC. 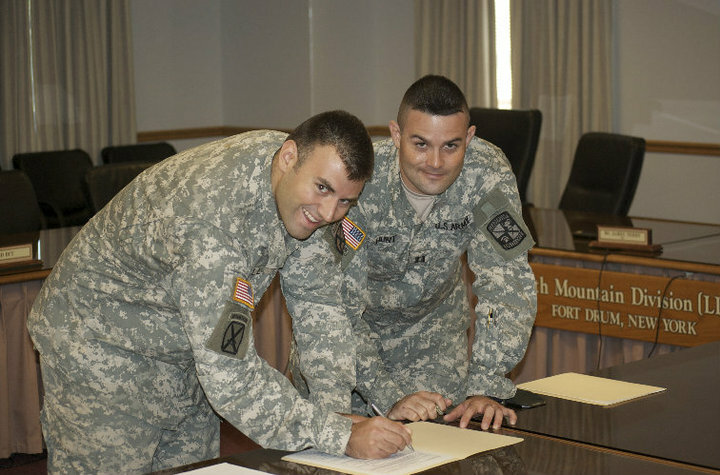 Assisting him (at right) is CPT Ryan Hunt, Green to Gold Recruiting Operations Officer for Second (ROTC) Brigade. 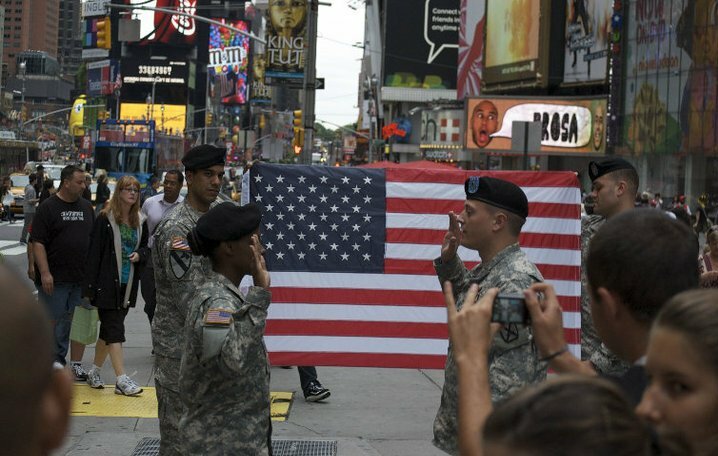 2LT Branden Irvine (center right) swears in SPC Sadie Kearney (center left) as a Green to Gold Cadet at Times Square in New York City. Kearney is a non-scholarship Cadet headed to Thomas Aquinas College (of the Fordham Army ROTC Program). Formerly stationed at West Point, Kearney is an SMP Cadet and will serve in the Army reserves while she is at school. SSG Matthew Duncan (left) getting pinned by CPT Ryan Hunt (right) with his ROTC Cadet "pip" insignia. Duncan is an Active Duty Option Green to Gold Cadet attending SUNY Oswego (part of Syracuse University ROTC) this Fall. 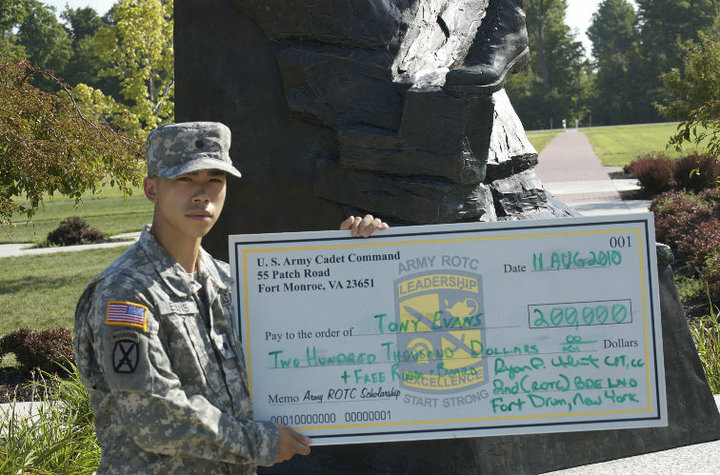 SPC Tony Evans displays the "big check" representing the value of his ROTC scholarship (the equivalent value of $200,000) to Niagara University. Evans is one of six CG's Hip-Pocket Scholarship Award winners on Fort Drum. In addition to this award, he will receive free room and board at Niagara (Purple Eagle Battalion). 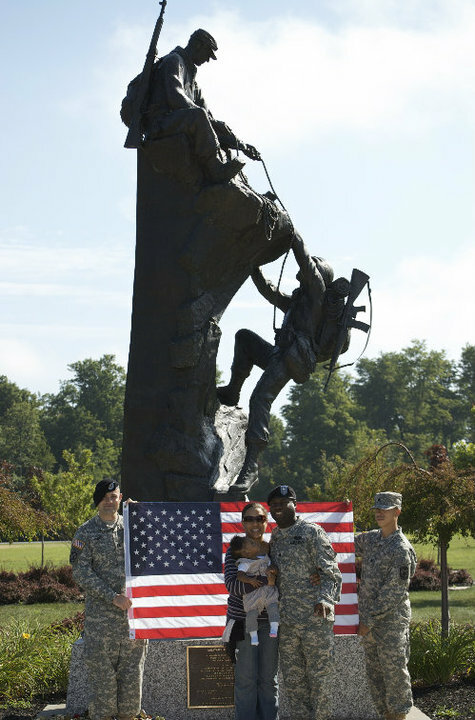 SGT Mark Saunders and his family (bottom center) in front of the 10th Mountain Division Monument on the day of his swearing-in as an ROTC Cadet. Saunders is an Active Duty Option Cadet and will be attending SUNY Potsdam (part of the Golden Knight Battalion). SGT Kyle Tobara (right) being sworn-in as an ROTC Cadet in front of Hayes Hall. Tobara is a CG's Hip-Pocket Scholarship winner and will be attending Hawaii Pacific University this Fall. 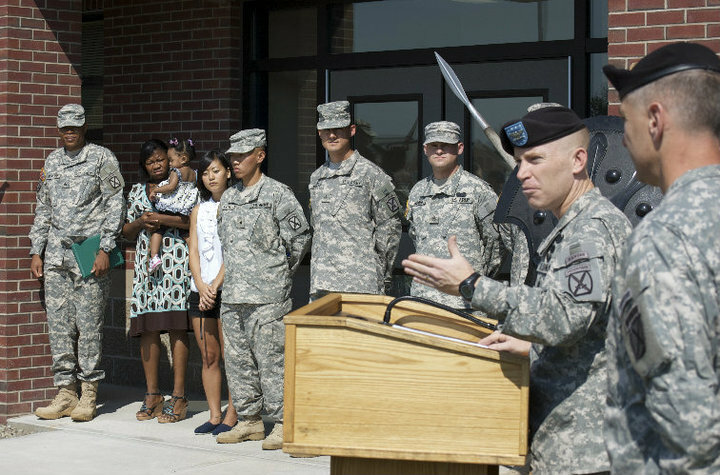 Colonel Patrick D. Frank, Commander of 3rd BCT, 10th MTN DIV (second from right) gives remarks at the swearing-in ceremony for five 3 BCT "Spartans" Soldiers accepted to Green to Gold: (from left to right) SGT Peter Dakurah (ADO, SUNY Institute of Technology), SPC Phillip Kwon (Non-Scholarship, SUNY Buffalo), SGT Vidal Garza (Non-Scholarship, SUNY Potsdam), SSG Andrew Hansen (CG's Hip-Pocket Scholarship, University of N. Illinois), and (not visible behind shield) SSG Jae Min Yandow (Non-Scholarship, SUNY Brockport). The Fort Drum Green to Gold Team would like to express our immense appreciation for your service to the United States of America. You set a tremendous example for all Warriors to emulate. You have stated that you are only “mediocre” and “average;” that your action was “not heroic.” By this, you truly exemplify the meaning of HONOR. You live according to the Army Values and the Warrior Ethos. 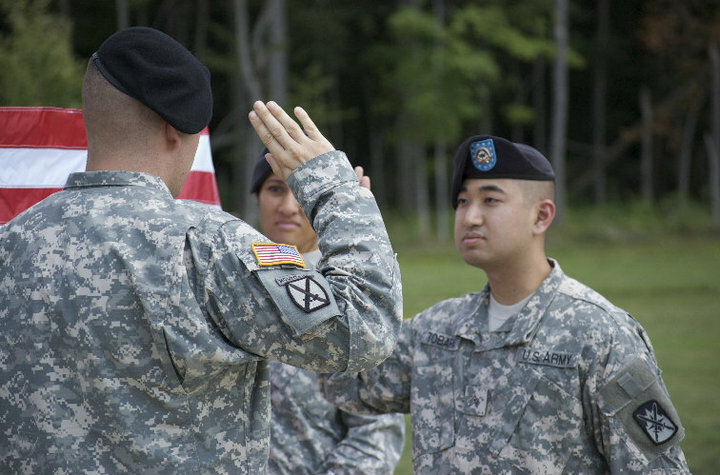 The Army needs your talent, experience, and dedication to honorable service. We ask you to lead the Army’s Soldiers as an Officer. You are certain to have many grand opportunities in your future. We ask you to consider an opportunity to be an Army ROTC Green-to-Gold Cadet. The Officer Corps would only be strengthened by your service. We will continue to follow your career, and draw strength from your Warrior spirit! We’re happy to announce our top five selections for Green-to-Gold schools nationwide. This announcement follows the 2010 April selection board, and is based on criteria such as: applicant’s school preference, military-friendliness, and ease of transition for Green-to-Gold cadets. 5. Massachusetts Institutes of Technology (MIT) – Located in Cambridge, Mass., and part of the Paul Revere Battalion, MIT is a well-recognized research and technology institution. The Paul Revere Battalion is an umbrella ROTC outfit for nine partner schools including MIT, Endicott College, and Harvard University. 4. Elmira College – Located in Elmira, New York, Elmira College is a partner school of Cornell University’s Excelsior Battalion. Elmira is a private liberal arts institution with an exceptional 4-year Bachelor of Science in Nursing (B.S.N.) program. 3. University of Cincinnati – The University of Cincinnati is an urban, public, research institution in Cincinnati, Ohio. It is the home school of the Bearcat Battalion. 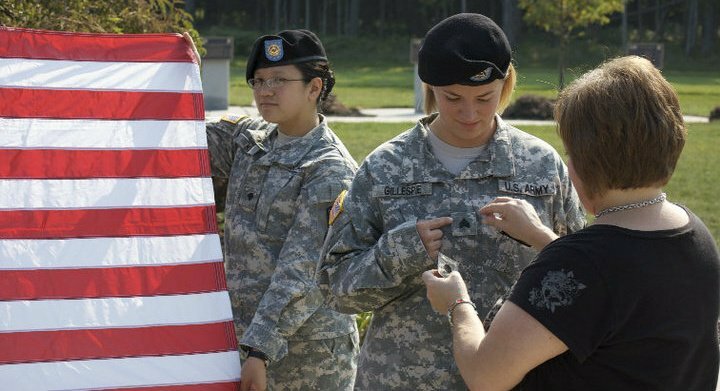 UC is ranked in the top dozen of all ROTC programs nationwide. 2. State University of New York at Brockport (SUNY Brockport) – SUNY Brockport is located in Brockport, NY and is home school of the Freedom Eagles Battalion. Brockport is a very military-friendly school and provides many benefits to incoming ROTC Green-to-Gold cadets. 1. State University of New York at Potsdam (SUNY Potsdam) – SUNY Potsdam is located in Potsdam, NY and is a partner school of the Golden Knight Battalion. SUNY Potsdam has a long history of hosting Fort Drum Green-to-Gold cadets and is a school-of-choice for many Fort Drum applicants. What the Green to Gold program is. The scholarship, non-scholarship, and active-duty options. The Fort Drum Green to Gold Advisor Team’s best advice for getting started on a Green to Gold packet. Look for more info videos coming soon! If you are looking for a university to apply to, as an important first step in their Green to Gold application process, you should consider a school inside the footprint of the 2nd ROTC BDE, also known as the “Freedom Brigade,” especially if you want to stay in the northeast. The Freedom Brigade spans across nine states in the northeast United States (New Jersey, New York, Pennsylvania, Connecticut, Rhode Island, Massachusetts, New Hampshire, Vermont and Maine). It includes 41 ROTC battalions located at “host” universities, along with 87 “partner schools” and 250 other affiliated institutions. Inside the Freedom Brigade footprint you will find prestigious universities such as Cornell, Massachusetts Institute of Technology (MIT), Princeton, and Clarkson University. You will also find outstanding and affordable state institutions like the State University of New York at Potsdam (SUNY Potsdam). You can even attend National MacArthur Award winning Rochester Institute of Technology (RIT). In summary, you have a LOT of options when deciding to attend a school in the Freedom Brigade footprint. Below we have included links with contact info for the 41 host battalions in the 2nd ROTC “Freedom” Brigade, as well as their partner schools and affiliated institutions.